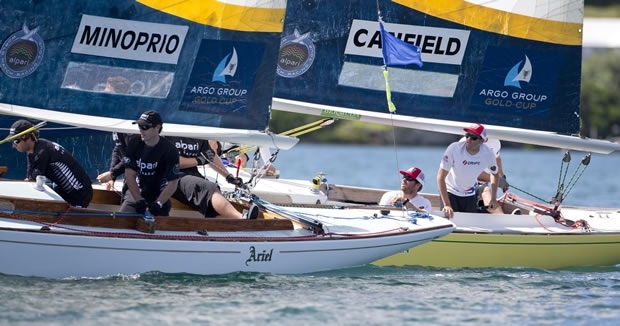 A major culling took place on day three of the Argo Group Gold Cup, the penultimate event on the 2013 Alpari World Match Racing Tour when the eight quarter finalists were decided from the 20 strong starting grid in Qualifying. 12 crews are now packing their bags and heading home. None of the skippers has so far survived without dropping at least one match. Three finished on 8-1: Ian Williams’ GAC Pindar team fell to Bjorn Hansen’s eWork Sailing Team, while among the two crews fresh from the America’s Cup in San Francisco, Ben Ainslie lost to Ian Williams, while Francesco Bruni’s Luna Rossa crew fell to Keith Swinton’s Black Swan Racing. Hamilton Harbour was its usual balmy self today, however the wind had veered into the southwest forcing David Campbell-James’ race management team to set shorter courses across the Harbour rather than down its length. Conditions were also lighter, challenging the tacticians with shifts and holes on the course. Ben Ainslie’s Argo Group-backed team managed to overhaul Pierre Antoine Morvan up the first beat and then led for the rest of his race, but in the second he was trailing Will Tiller’s Full Metal Jacket team only for the Kiwi team to sail the wrong course, thinking they had finished after two laps, rather than three. Swinton was pleased to have beaten Bruni, but his toughest match was against Johnie Berntsson, in which he came out on top. The Australian skipper felt today’s luck made up for a disappointing first day when he lost two points through his boats twice experiencing main halyard failures. The highlight of their day was racing Adam Minoprio and his Team Alpari FX. In this Canfield led off the line only for Minoprio to catch up. “We came back together and we got a red flag penalty for tacking too close and forcing our way between Adam and the mark,” explains the US Virgin skipper. They carried out their penalty and it appeared to be all over when Canfield caught a gust to roll past Minoprio and take the win.